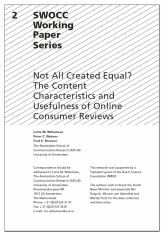 The aim of the present study was to gain a better understanding of the content characteristics that make online consumer reviews a useful source of information. To this end, we content analyzed reviews of experience and search products posted on Amazon.com (N = 400). The insights derived from this content analysis were linked with the proportion of ‘useful’ votes that reviews received from fellow consumers. The results show that content characteristics are paramount to understanding the perceived usefulness of reviews. Specifically, argumentation (density and diversity) served as a significant predictor of perceived usefulness, as did expertise claims. The effect of review valence was contingent on the type of product being evaluated in reviews. The broader theoretical, methodological and practical implications of these findings are discussed.